This September was the coolest since 1993. The average mean of 13.4C is 2C below average – a surprising statistic given that the month ended with many bright and sunny days with respectable temperatures. But, with the wind in the east, caused by an anticyclone anchored to the north of us at the end of the month, the air was dry and allowed temperatures to fall smartly away after dark. The average minimum temperature was just under 8.8C, 2.3C below average and the coldest since 1986. The month was rather dry: some 42mm of rain fell which is 81% of what we can expect in an average September. The wettest day was the 16th when 17.6mm fell. Just over 140 hours of sunshine were recorded – that’s ‘on the nose’ of the monthly average and 20 hours more than was recorded during the very dull August. What has October got in store weatherwise? The models today (October 1st) suggest an end to the fine and sunny weather as high pressure declines and is replaced by a trough moving up from the southwest on Monday. Less clear is how the weather evolves from then with the majority of models showing this feature opening the door to a lengthy period of SSW winds and possible rain at times. 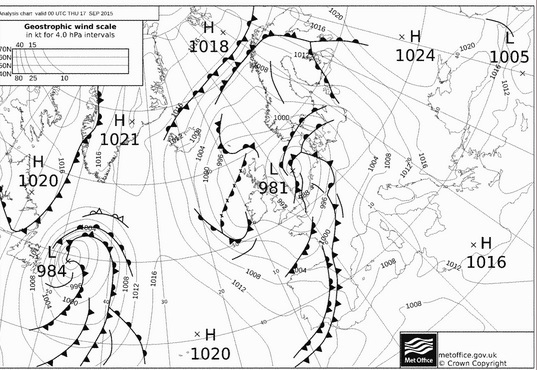 However, the rain would become more restricted to our northwest as pressure builds from the continent. So a return to something more autumnal looks likely though temperatures will remain on the mild side, especially at night. My long range outlook method suggests that October will be average temperature will be average temperature-wise, a mean of about 11.8C, at 44% probability. The next highest probabilities are for something cool, at 22% probability. Something rather cool or very cool comes out at 11%. There appears no chance for a mild month. The highest probability for rainfall is 33% for something rather wet: between 84mm and 100mm. The next highest probabilities is for an average, rather dry and dry October at 22%. My data for sunshine only stretches back to 1878. The signal is inconsistent so I would guess sunshine will be average. My September outlook for sunshine was good in that I estimated that there was a 60% chance of average sunshine. Less good was the finding that there was only a 23% chance of a dry September – the highest probability was for something average. And my temperature estimation put the probability of a rather cool September at only 14%. So, all in all, not great. 1st Cloudy start though with some brightness. 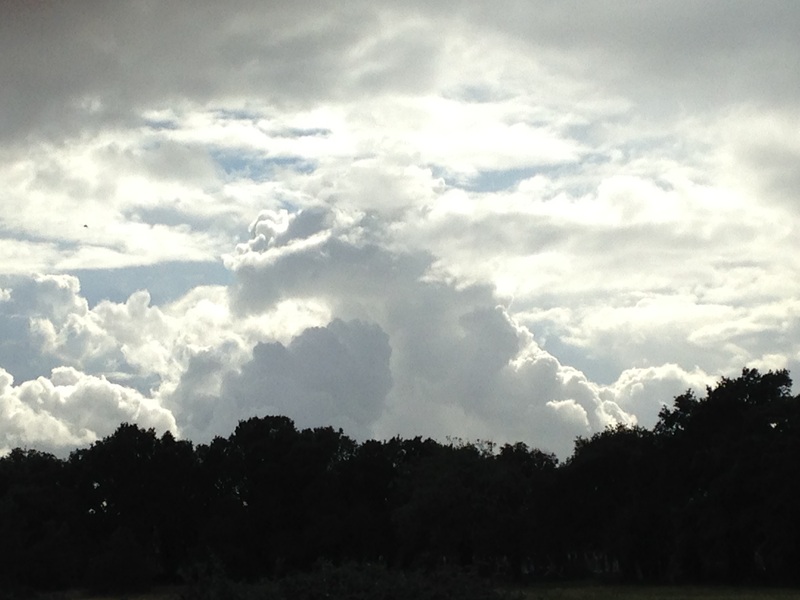 Small shower mid afternoon which was the edge of large storm that affected Essex. 2nd Sunny bright start though with lots of cloud from noon. Lots of convection. 3rd Cool, cloudy start. Some brightness but feeling cool in the wind. A few spots of rain. 4th Bright start with some sunshine tempered by the breeze. Mostly cloudy all day. 5th Light rain to start with brighter spells. Problem of being on the edge of high pressure. A sunny afternoon. 6th Sunny start with just a few clouds during the day. 7th Sunny start but cloud gradually increased during the day. 8th Cloudy start, overnight ‘rain’ was dew. Mostly cloudy all day. Warm overnight. 9th Cloudy start but a few holes appearing as the day wore on and sunshine at 1330. 10th Sunny start though with cloud bubbling up sunny spells followed. Clear with heavy dew overnight. 11th Sunny start with wispy cirrus – more cloud bubbling up during the day. 12th Cloudy start over overnight rain. This breaking up toward late morning to leave a sunny spells afternoon. 13th Cloudy start – this breaking up toward noon to leave bright afternoon. Some rain overnight. 14th Cloudy start, rain arrived soon after 10am and lasted over an hour. Then bright spells and more showers through the day and into the evening and overnight. 15th Cloudy start with heavy shower moving in at 12.30pm. Showers cleared through to leave cloudy early evening. 16th Cloudy start with rain spreading in at 12.30pm. Some heavy bursts through the day. Rain all the way in to work and torrential rain coming back from school at 5.30pm. Bursts through the evening and light drizzle was falling on way home at 1am, tending to peter out. 17th Sunny start tending to cloud in more. 18th Bright but cloudy start with clouds bubbling up. A heavy shower by 1pm. 19th Sunny all day with odd cloud. Warm in sun. 20th Sunny all day, any cloud decreased. 21st Spots of rain just before obs time. A mostly cloudy day. Heavy, showery rain between 5.30am and 7.30am. 22nd A cloudy, chilly day with rain after noon. 23rd Sunny, gin clear start. Clouding over by 2pm with rain at 1am. 24th Bright start after rain overnight. Sunny spells developing – a late shower at 1534. Dry and clear overnight. 25th Sunny start though with cloud bubbling up the sun disappeared at times. Cold overnight with a heavy dew. 26th Sunny and clear to start, though with cloudier periods through the day. 27th Sunny clear start with a few clouds bubbling up through the day. Mostly clear for lunar eclipse totality at 3.11am. 28th Sunny start with long clear periods during the day. 29th Mostly sunny with just some cirrus. 30th Sunny start with just a few cirrus. Stronger breeze than yesterday.